Esko Aho, Finland’s former Prime Minister and Nokia’s former Executive Vice President, starts as a lecturer at Aalto University. We asked what the man who steered a small state and large corporation wants to instill in his students. He still looks pretty much the same, even after more than twenty years. Esko Aho was a familiar sight in Finnish living rooms during his years as Prime Minister between 1991-95. It was the era of linear TV, when most Finns would routinely sit down to watch the evening news at 8.30 pm on the dot. Finnish domestic and foreign politics were going through dramatic stages, and night after night the Prime Minister would give his comments on the headlines of the day. Finland was in the depths of recession, plagued by mass unemployment, a banking crisis, and the weakening of the Finnish markka. Its economy took a sharper downward turn compared to many other European countries. Trade union leaders protested against the budget cuts of the bourgeois government, and industry representatives demanded devaluation. The Soviet coup d’état attempt took place less than three months into Esko Aho’s premiership. The situation dissolved, yet was tumultuous. Estonia and Latvia declared their independence, Estonia seeking Finland’s recognition. One crisis after the next landed on Esko Aho’s desk." One crisis after the next landed on Esko Aho’s desk. He was only 36 years of age at the time of his election, with no ministerial experience. Despite harsh criticism that was fired at Esko Aho at times, his government remained in office until the end of the term. Now, twenty years later, we get to ask what leadership lessons Aho came away with during those years. True to his character, Esko Aho can’t resist reframing the question. Sitting in a café on the edge of Helsinki Market Square, he divulges some background. After leaving politics, he served as Head of Corporate Relations and Responsibility and as an executive board member at Nokia. According to Aho, both politics and his time at Nokia taught him a great deal about leadership, and there’s no need to separate these overlapping experiences. “Although the recruitment and success indicators of politicians differ from the corporate world, the two realms share a great deal of leadership lessons”, says Aho. What did Aho learn about leadership while serving Finnish people and Nokia? First lesson: A leader mustn’t be afraid of anything or anyone. In Aho’s words, the context in which leaders make decisions has changed. As a result of digitization and global value chains, the future is hard to predict. The situation needs a broad understanding and courage. This is where lesson number two comes into play. Second lesson: Repair measures are usually inadequate. According to Aho, repair measures and change are the responsibility of leaders. Courageous leaders don’t hide behind conditions, or expect their decisions to be welcomed with open arms. As many as nine ministers left Aho’s cabinet, some because of differences in opinion. Eeva Kuuskoski-Vikatmaa resigned from government and her post as Minister for Social Affairs and Health as a protest to cuts implemented under Aho’s leadership. This brings us to lesson number three. Third lesson: Don’t expect praise. Aho mentions Nokia as an example. “Who is to blame for mobile operations ending up in crisis?” he asks. Many point the finger at Stephen Elop, the CEO who jumped on the scene from Microsoft. Aho explains that he saw from the sidelines how Elop became a leader at a time when there was very little left to do. Elop simply sowed the decisions made by his predecessors. Fourth lesson: A normal, balanced life to counteract pressure. Fifth lesson: Surround yourself with better people. During his years as Prime Minister, Aho wrote his key speeches himself. According to Aho, preparing them took a great deal of time. Teamwork was the applied method, sitting in front of his machine surrounded by 4-5 people. He wrote, while bouncing his thoughts with others. Aho sees writing as a vital tool. It’s like thinking, forcing to crystalize what you pursue. Rather than getting preoccupied with thousands of details, leaders need to decide which issue, change, or policy they want to personally steer. This points us to Aho’s final piece of leadership advice. Aho highlights that many organizations simply don’t think strategically anymore; they focus on operational activities and react to their surroundings, rather than looking into the future. Corporate strategies become operative implementation programs instead of actual strategies. 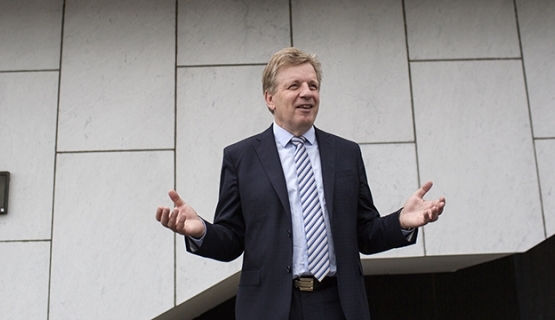 These days, Esko Aho is a free agent, dividing his time between being an expert in Russian affairs, an international consultant, and board work. In the fall, he will take up a position as Executive in Residence lecturer at Aalto University. He heads the annual Business and Society course, focusing on global and local changes in corporate environments. He will also be lecturing on economic themes relating to Russia. The appointment is for a five-year period. We meet up at the end of the summer, and Aho tells me about the past golf season with his friends – “talking about things that matter at the same time” – and how he has finally managed to read through a pile of International New York Times and Financial Times papers he didn’t have time for in the winter. He prefers to read his newspapers in print, cutting out interesting articles for his extensive archives as he goes. Aho explains how he feels just as comfortable in a San Francisco beach café and the Finnish countryside. He first left Finland after losing presidency to Tarja Halonen in the 2000 elections, and became a fellow at the Institute of Politics and adjunct lecturer at the John F. Kennedy School of Government at Harvard University. Also his second stint abroad in 2012 led him to Harvard, when he spent two years as senior fellow at the Mossavar-Rahmani Center for Business and Government. In Aho’s view, there’s still plenty of work to be done in opening up Finnish universities to the outside world. He appreciates the U.S. model, where the transition is extremely smooth. You can’t help think Esko Aho would have appreciated an invite to lecture at a Finnish university already earlier on. A teaching role probably comes naturally to Esko Aho, who takes a lecturing stance even during the interview. It’s a familiar trait already from his time as Prime Minister. He doesn’t shy away from giving advice and instructions. So let’s ask what Aho would like Aalto students to learn on the new course. Is there an underlying thought he’d like to leave with the students? Aho comments that the public sector and its influence on the operating conditions of companies is the most vital issue. As for leadership lessons, Aho is reluctant to differentiate between public and private sector experiences. The basic underlying principles are always the same when it comes to leading people. Although leading a state does differ from managing a company. As Aho left politics behind and headed into business life, he noticed that the key difference between the two realms was that politicians continued to be responsible for people also after tough decisions. A company that lays off people is no longer responsible for those people, whereas the state operates according to a different logic. When an organization in society cuts down the number of personnel, those people are still part of society. They don’t disappear from the system, even if they disappear from the salary slips of a government office. During a tougher economic climate, it’s common to talk about the state as you would about a company: as a financial unit that needs to maintain its competitive edge through harsh financial measures. But the state is a whole lot more, with an economy that has its unique logic. “Companies have a limited responsibility and politicians a limitless responsibility for people. They remain part of society even after decisions have been carried through”, explains Aho. The corporate decision-making model provides a relatively fast and linear progression. It follows a clear order: the biggest boss decides. The democratic principle, on the other hand, is to ask just about everyone before making a decision. According to Aho, the quality of public sector decision-making is inferior to that of the private sector. He thinks consensus doesn’t work as a decision-making model, if society is going through tumult. On his course, Aho plans to present an alternative to “defending the past”. A good example is the Nokia Bridge program from 2010-13, at a time of one bout of co-operation negations and layoffs after the next. During the Bridge program, ex-Nokia employees founded a thousand companies, 400 of which were established in Finland. The idea of the program was for employees having to leave to be given an opportunity to plan their future with an expert, whether it would involve a new job, setting up a company, or something else. The program also provided financial support for studying or starting up a company. On the other hand, ex-Nokia engineers and ICT professionals would have probably found employment rather easily even without the program. But could the model be adapted to, for instance, industrial companies? At least Aho thinks so. Today, those born or raised during Esko Aho’s premiership make up for a large share of university students. In Finland, this generation is known as “children of the recession”. They would have only briefly seen the evening news sitting on their parents’ laps just before bedtime.